Update – The information posted in this article is not official but just an expectation of the upcoming keynote from Neogaf. We might not get to see any of the said technologies so its better to keep your expectations low. NVIDIA’s Graphics Technology Conference 2014 (GTC ’14) commences today and the graphics giant is going to showcase their latest technologies during the three day long event. It looks like NVIDIA is geared up for the key note tomorrow where CEO of the company, Jen-Hsun Huang is going to preview their latest 20nm Maxwell GPU architecture along with other innovations in the graphics industry as revealed by Pro-Clockers forums. There has been speculation going on over the past few months that whether GPU companies will release their next generation graphics cards on the 20nm node or move to some other process. Well, it looks like NVIDIA is officially going unveil during the keynote that Maxwell is based on a 20nm architecture and will feature support for UVM (Unified Virtual Memory) when it hints the market in second half of 2014 as the GeForce 800 series. This is exciting news since Maxwell itself would be the first architecture that is confirmed to be build on a 20nm node and features Unified Virtual Memory support which will allow the GPU and CPU, both to share the system memory and graphics memory in a coherent manner. It is also hinted that NVIDIA will specifically be previewing their GM10* GPU architecture. We have already seen the GM107 core which is the one featured on NVIDIA’s recent GeForce GTX 750 Ti and GeForce GTX 750. The GM107 which is NVIDIA’s first generation Maxwell core delivers brilliant efficiency and the most highest performance per watt. The 20nm Maxwell cores which are presumably based on the second generation Maxwell GPU core would further enhance the performance per watt for GeForce and Tesla parts. It is very likely that the first high performance cards would be aimed towards servers like the GK110 which was given to the workstation/server market first before heading to consumers in the form of GTX TItan, GTX 780, GTX 780 Ti and GTX Titan Black. The architecture preview will detail alot of things we currently don’t know regarding Maxwell but its highly unlikely that we would get to see any sort of card samples this early since launch is planned for 2H 2014 as pointed out earlier. 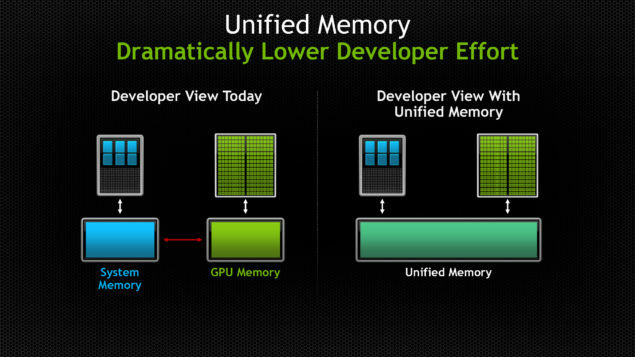 NVIDIA also hasn’t mentioned Denver CPU in the Keynote’s overview which is long been hinted to featured on Maxwell generation of cards but has only been seen on NVIDIA’s Tegra K1 chips. The overview also mentions that NVIDIA would be showcasing several demos based on DirectX 12 and OpenGL APIs. NVIDIA has been working hard to develop and optimize their hardware for the upcoming APIs and we have already seen their dedication by porting FORZA 5 to DirectX 12 in a month with a team of just four men. Some of the demos will showcase their GameWorks tools working in action and the recent ones which they have show cased during GDC 2014 which shows dynamic grass physics, flameworks and FleX (Unified PhysX). There’s also a mention of NVIDIA’s upcoming GeForce driver which would be showcased at the event. We had recently talked about this GeForce driver which as shown by NVIDIA aims to improve DirectX 11 efficiency and optimize GeForce graphics cards specifically for the API to improve their performance by a great margin in a list of several gaming titles. You can check out an overview of the upcoming GeForce driver in this link. It’s time again for NVIDIA CEO Jen-Hsun Huang to open the annual GPU Tech Conference with a 2-hour keynote. The show’s on from 9:00am to 10:50am. – Preview of the new 20nm high-end Maxwell GPU architecture (GM10x/GeForce 8xx) with unified virtual memory. – Amazing real-time graphics demos (as always). – More DirectX 12 goodness.